Did you watch the Saturday Night Live 40th Anniversary special the other night? For the most part it was a fun, frolicking trip down memory lane with homages to our favorite characters and sketches. It was also bittersweet remembering the many deceased cast members who could not physically be there: John Belushi, Gilda Radner, Chris Farley and Phil Hartman, to name a few. But a sobering moment also came for me when Mike Myers and Dana Carvey reprised their characters Wayne and Garth for a Wayne's World skit, presenting the Top Ten Things About SNL. They reminded us that three Beatles had performed on the show. That's when I realized that, remarkably, the one Beatle who should have had the greatest chance of appearing on SNL never actually did: John Lennon. It really is amazing to me--and somewhat shameful--that Lennon never added himself to the long list of SNL's musical performers. Unlike Paul McCartney, George Harrison and Ringo Starr, he made New York his full-time, permanent residence. And never mind merely performing--he would have made a great host for the show, with his natural comedic tendencies. It did almost happen, when Lorne Michaels half-jokingly offered the Beatles $3,000 to reunite on SNL during its first season. Paul McCartney happened to be in town when the show aired. Both he and John Lennon saw it and nearly went to the NBC studio to take Michaels up on his offer, but decided it was too late and that they were both too tired. Besides, it wouldn't have been a true Beatles reunion unless all four Beatles had actually been there. Lennon had no real reason to perform on SNL, anyway. He had pretty much retired from music in the mid-70s to focus on being a house husband and taking care of his son Sean. There was no new album to promote until 1980's Double Fantasy. 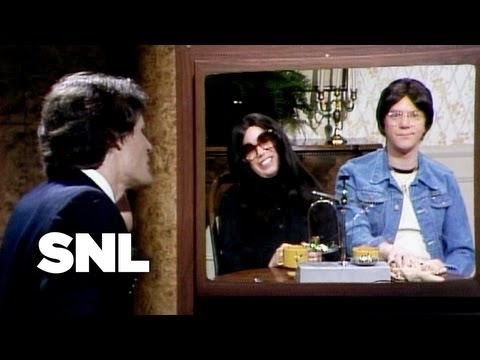 SNL instead "interviewed" Lennon and Yoko Ono (as played by Malcolm McDowell and Denny Dillon) during an amusing "Weekend Update" segment in 1980, in anticipation of the new album...which contained (according to "John" here) "love songs and a few oven cleaning tips." Jimmy Fallon also played Lennon in a 1998 sketch with Cheri Oteri, Chris Kattan, and Vince Vaughn--totally confusing his fans by speaking in opposites. It's quite possible that Lennon would have been considered to perform a couple of songs from "Double Fantasy" on SNL had it not been for the tragic end to his life in December 1980. As it is, we're left with George Harrison performing a duet with Paul Simon on "Homeward Bound" and "Here Comes the Sun", Ringo Starr on Fernando's Hideaway and Paul McCartney being interviewed by Chris Farley. Can't really complain. Here's some clips of the individual Beatles appearing on SNL through the years. You may have to click on the last video to get it going but trust me--it's worth it. Watch for Paul's bizarre cameo in the middle of the "Stumblin'" song. Pam, you know I love all things Beatle! John Lennon was my favorite, but I jump at the chance to see anything with any of them. IMHO, had Lennon lived, he would have been on SNL at one time or another. After Double Fantasy, I was looking forward to seeing more stuff from him, in general. It's so sad that it was not to be. What a waste! Great post! Loved it. The videos were a big plus. Hi Cherdo - same here; love the Fabs...and I must admit I had never seen the Ringo/Martin Short cold opener until tonight. What I love most about it is the audience's reaction when Ringo is brought out--and if I saw correctly, he gave a little wink to them. Good times. I agree that SNL would have had a ball with Yoko.